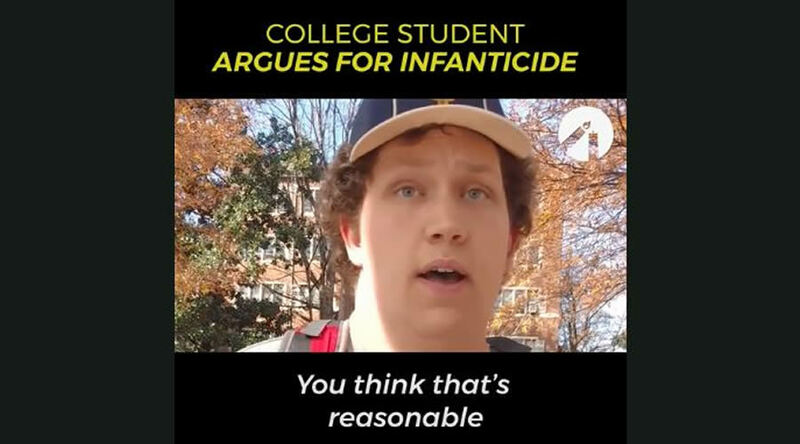 From the University of Tennessee-Knoxville comes word of a shocking video of a student arguing in favor of infanticide — killing babies up to two-years-old. The video was filmed by Students for Life of America on the campus of Tennessee’s flagship taxpayer-funded university. “The idea that someone could support infanticide is incredibly disturbing. Yet, it reflects the kinds of attitudes our staff members and students can face on a daily basis on high school and college campuses,” Students for Life of America president Kristan Hawkins said. Brenna Lewis, SLA’s Appalachian regional coordinator, recorded one of the encounters in early December with a young man who said he had no problem with aborting two-year-old babies. But what if the baby is two-years-old? “Life is only valuable if I can talk to it?” she asked. “When countries such as Iceland normalize the deliberate killing of babies with Down syndrome or states like California want to normalize abortion drugs on campuses, we should not be surprised when students display a wanton disregard for human life,” Hawkins said. Newborn human babies have no sense of their own existence over time. So killing a newborn baby is never equivalent to killing a person, that is, a being who wants to go on living. That doesn’t mean that it is not almost always a terrible thing to do. It is, but that is because most infants are loved and cherished by their parents, and to kill an infant is usually to do a great wrong to its parents. An unspeakable wickedness has infected many of our public university campuses. What kind of society are we to fund places that advocate for the slaughter of newborn babies? 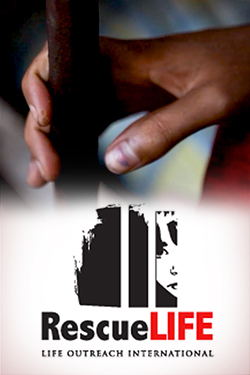 What kind of people have we become to turn a blind eye to such atrocities? Originally published on ToddStarnes.com, January 4, 2018 and is reprinted with permission. Todd Starnes is host of Fox News & Commentary, heard on hundreds of radio stations. Sign up for his American Dispatch newsletter, be sure to join his Facebook page, and follow him on Twitter. His latest book is God Less America: Real Stories From the Front Lines of the Attack on Traditional Values. The reprobate mind is a scary thing. He talks about lack of sentience being justification for murder, while simultaneously displaying no feeling or perception himself, which I guess then it makes sense that he would say that. Like you said, “displaying no feeling or perception himself” – so if he talks of himself when talking of lack of sentience in effect – to which no reasonable jury would sentence him to death. You are right, he has no justification for what he is saying. Tell him to kill his dog and see how he reacts. Exactly. I would think PETA would be coming after him and others for going down that road – as they should. What an absolute ignorant madman. Of course a two year old is sentient – the definition of “sentient” being “able to see and perceive things.” The young man is himself is not sentient since he cannot see that a child is a human person. Would he advocate for murdering himself since he cannot see reality? Disturbing? Try murder and pure evil! This parasite should be struck down as should anybody else suggesting murder of a child! Hang him! This guy is arguing that the human life worth legally protecting is the one that in sentient. His position makes perfect sense in a world where abortion advocates have blurred the line on when life begins in order to dehumanize their victims. If not at conception then when? What’s the difference between a late term partial birth abortion and tossing your infant off a cliff? If the kid is unwanted then what difference does the timing make when you kill it to make it go away? Take God out of the equation and this is what we get. Has this guy ever meet a 2 year old. They definitely have their wants and desires and usually are pretty darn effective and not shy about communicating them. So the entire example laughably stupid. Which is why people who are against in-womb infanticide like myself use it, “you would not kill a baby in a crib would you?” But the abortionists have figured out we were right all along and there are really no bright lines between that “clump of cell” they like to talk about and human beings. So now they move the goal posts; out and out until no baby’s can meet them but an inch at a time so they can trick people into thinking there is some rational thought behind their actions. Someone ought to remind this guy he spends 6 or more hours a day sleeping during which he is uncommunicative and hardly self aware. Would be ok if someone “aborted” his return to consciousness? You’re oh so right. Any one who has met a two year old knows all too well how they can communicate exactly what they want and when they want it, as well as the volume of that communication. They do not call them the ‘terrible twos’ for nothing. His argument has been debunked long ago. For the same reason we could also kill a sleeping person, for example. But I am in favor of allowing this obviously wrong video to stay up. He makes a public fool out of himself. This is simple wickedness. To even take time to ponder this is evil but, moreover, moronic. Each phase of life is necessary to get to adulthood. To stop along the journey and say because it is not complete it is not of value is like saying the home that is being built, but yet roofed, can’t properly protect any occupants so it is useless and can be torn down. Are the cars on a production line not cars until they can roll off? Can the Retriever yet trained to execute its instinctual duties be put down? Why not trudge around the garden in May? It’s not food yet. All that aside, to even suggest that such precious beings must justify their existence is beyond perverse. Especially by someone, when vulnerable, clearly, was given the grace he would like to now deny others. We are not enlightened by the discourse but sullied. I challenge that student to prove his own sentience. Communist and Fascist regimes/leaders all had and have the same mentality. The statements he makes and the so-called professor made sound like something an SS officer working in the death camps would’ve uttered. If this is where our country is going, we are indeed doomed. Just to even conceive of this…Sadly this young mind is the clear definition of the Biblical Reprobate. My My, How Far we have Fallen! We are living in a Sick Sick World! God Help us! Does he not realize he was once an innocent baby? I doubt he realises what day it is most of the time. The combination of supreme arrogance and supreme ignorance in a single individual is always a scary thing to see. Unfortunately, this man has both in spades. The truth behind his comments is, I think, even sadder. It is obvious this man does not possess sound critical thinking skills or basic common sense and as such is easy prey for the sadistic minds which have infiltrated many institutions of learning. That is what we should concentrate on, getting these sick and twisted professors out of the schools at all levels.